Employing NVT’s StubEQ™ technology, the NV-842 is an 8-channel active (amplified) hub that allows the transmission of full-motion monochrome or color video for distances up to 2,000ft (600m) using Category 2 or better unshielded twisted-pair (UTP) wire. 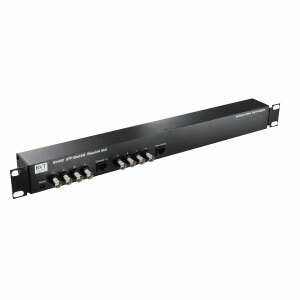 The receiver hub continuously and automatically conditions the video signal, compensating for cable attenuation, ground loops, and voltage transients, independent of video signal content. The unparalleled interference rejection and low emissions allow long run video to co-exist in the same wire bundle as telephone, datacom, or low-voltage power circuits. This allows the use of shared or existing cable plant. Ground-lifting ensures no annoying “hum-bars” when ground-potential differences exist. With built-in transient protection, damaging voltage spikes are eliminated. View Datasheet The NV-RJ45A RJ45 to Screw Terminal adaptor is wired in accordance with the EIA/TIA 568B wiring standard for structured cabling. This is the same standard that NVT uses in all our products. Please refer to the wiring/pinout diagrams for details as to how UTP conductors are landed on the screw terminal side and marked according to each input channel. Learn how NMSU saved over $1 million and fast tracked their modernization by 3 years. Secure product availability by registering your opportunity! Eliminate barriers to IP camera modernization! Learn how.